HomeElder CareWhat is an Oxygen Concentrator? An oxygen concentrator is a medical device used to deliver oxygen to those who have low levels of it in their blood. It is a relatively new product in India, where many are more aware of Oxygen Cylinders. 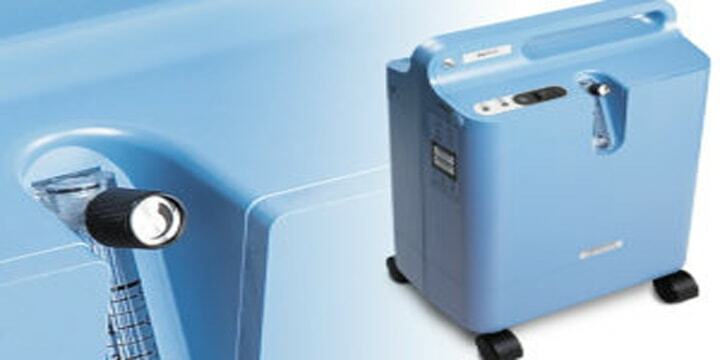 An Oxygen Concentrator should not be confused with an Oxygen Cylinder. Whereas a cylinder has a set amount of oxygen that it dispenses, a concentrator filters in air, compresses it and delivers that air continuously. The air supply will never run out. Instead of refilling compressed air, the concentrator just needs access to power. Oxygen concentrators are powered through electricity or a battery. There are of course differences between competing brands and models, but generally several basic parts make up a concentrator: a compressor, sieve bed filter and circuit boards. An oxygen concentrator works like an air conditioning machine: it takes in air, modifies it and delivers it in a new form. The only difference is that a concentrator purifies the air and makes it available for patients who have low oxygen levels in their blood. A TriBeCa Care expert can train you how to use an Oxygen Concentrator, how to look after it and how to ensure it is working properly. You can also visit the TriBeCa Care E-store to know more about Renting or Purchasing an Oxygen Concentrator. Remember: If you want to BUY or RENT an Oxygen Concentrator at the best price, please call TriBeCa Care on +91 33 402-77777 for more information.